Lawrence LOVES a runaround retrieving a tennis ball or twenty. He is sooooo happy doing this and sooo doesn’t want to leave the paddock and go back to his kennel at the end of playtime so has anyone got a average sized garden and few tennis balls that are currently redundant? If you have, Lawrence could help you in putting them to use! Little Lawrence such a good boy , He loves walking with the kennel dogs and is such a calming influence on the more stressed dogs. Today we walked him alongside Lottie who is a young playful girl still a pup at heart , Lawrence trotted along happily by her side and she soon followed suit and walked calmly with him . He's very easy to walk and doesnt bother with other dogs on or off the lead. He will need support gaining trusts and being introduced to strangers, but once your his person his love is for eternity , he loves sitting with you cuddling and enjoys the closeness of his humans. Lawrence is such a sweet boy , A tiny package who loves to play , walks beautifully with other dogs, ignores off lead dogs or noisy dogs in the distance his walks mean everything to him , he'd rather concentrate on the sights and smells around him. He loves the water and will wade in whatever the temperature. He needs a home where he feels safe and loved and the rewards will be worth it, such a loving boy when you have his trust. Looking for his forever home . Little Lawrie has been fantastic recently meeting new walkers .He's accepted them in his kennel leads on and he's off for a walk .He walked excitedly alongside Jethro checking him out constantly and following his lead quite literally ! Jethro dived in a muddy ditch , so did Lawrie they both had tremendous fun digging out the ditch as I slipped backwards into it, head to toe covered in mud !! Lawrie gets confidence from his walkers and walking with his kennel friends .When he knows and trusts you he gives the most amazing cuddles burying his little head under your arms asking please let me stay here forever .!! Little Lawrie. Such a lovely soul. He can become worried with new people and new environments but once he feels safe, a happier boy would be hard to find. We spent an hour together today with a little walk and then a game of fetch in the paddock. Lawrie LOVES playing with a tennis ball and will happily retrieve the ball, drop it at your feet and then patiently and politely wait for you to throw it again - no grabbing of the ball, no barking - just politely waits. Today I had a sit down on a chair in the padddock and Lawrie launched himself onto my lap! We had lovely cuddles and he appeared to really enjoy some back scritches. 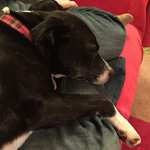 Little Lawrie is settling in well with his foster pack... From day one, he has been very comfortable with us and with the other dogs, although a bit more work will be needed with the cat!